lants for wast ewater treatment is increasing. water dose were also investigated. purchased from Zhonglong Kaolin Ltd., Chi na. after which the sample was settled at ice bath for 2 h.
decomposed easily under daylight or high temperature. dried in a vacuum oven. car bon, hydrogen and nitrogen, was undertaken. 610 nm by using JASCO V-500 Spectrometer (Japan). 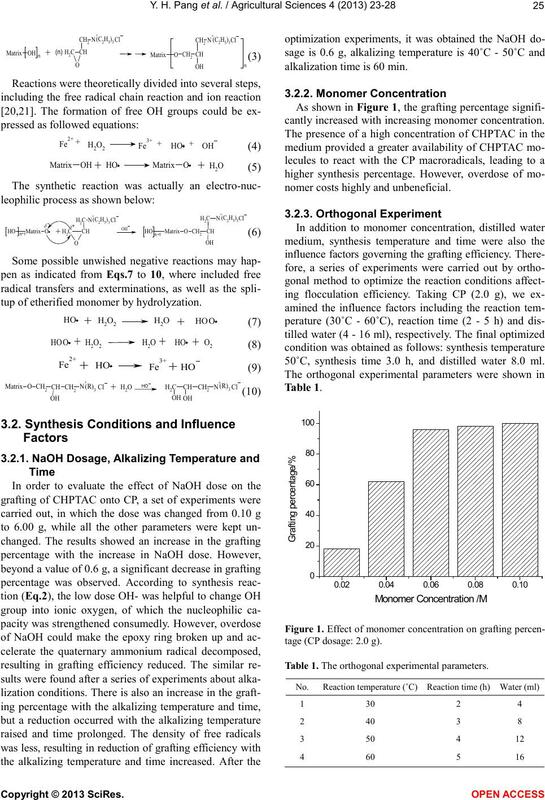 etherifying processes as shown in Eq s.2 and 3.
tup of etherified monomer by hydrolyzation. alkalizatio n time is 60 min. cantly increased with incr easing mono mer concentration. nome r co sts hi gh l y and unbeneficial. 50˚C, synthesis time 3.0 h, and distilled water 8.0 ml. tage (C P dos a ge : 2.0 g). Table 1. The orthogonal experimen tal parameters. cova lent li nkages . poration of cationic monomer onto the backbone of CP. Table 2. Results of Elemental Analysis. Figur e 2. IR spectra of (a) CP, (b) alkalized CP and (c) DXSL-I. Figure 3. SEM micrograph of CP. Figure 4. 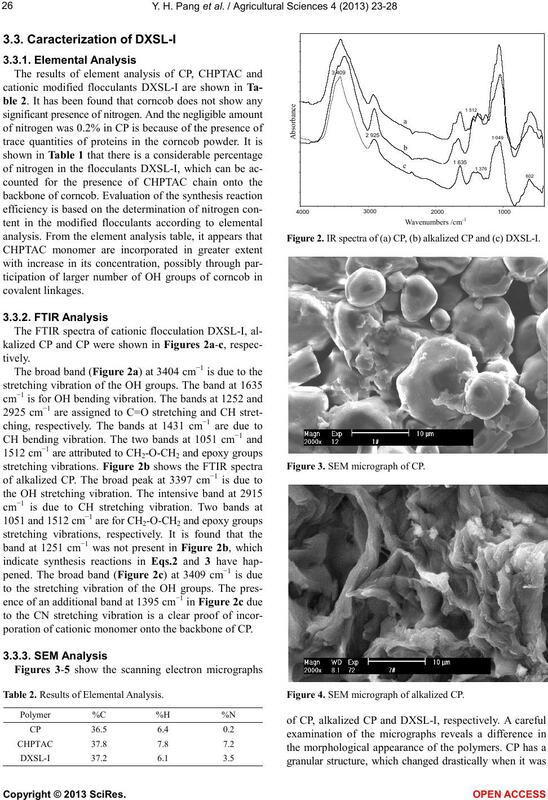 SEM micro graph of alkalized CP. Figure 5. SEM micrograph of DXSL-I. Figure 6. 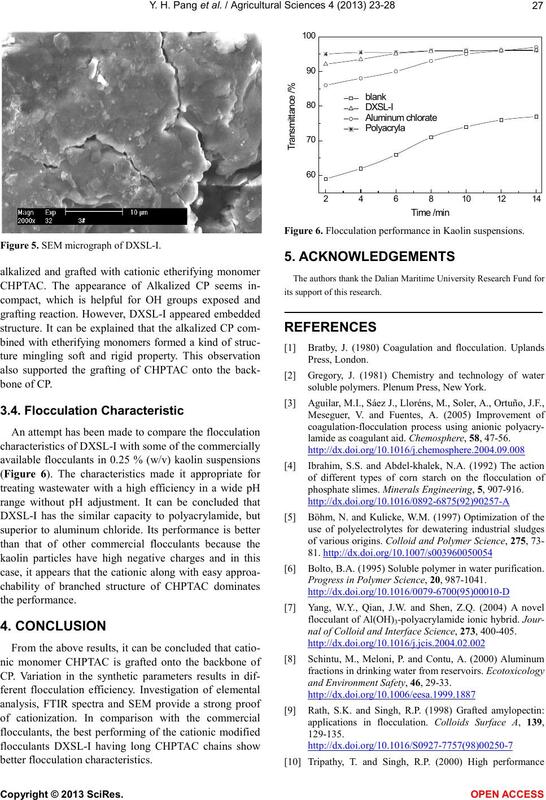 Flocculation performance in Kaolin suspensions. its support of this research. sol uble pol ymers. Plenum Press, New York. lamide as coagulant ai d. Chemosphere, 58, 47-56.
phosphate slimes. Minerals Engineering, 5, 907-916. Bolto, B.A. (1995) Soluble polymer in water purification. 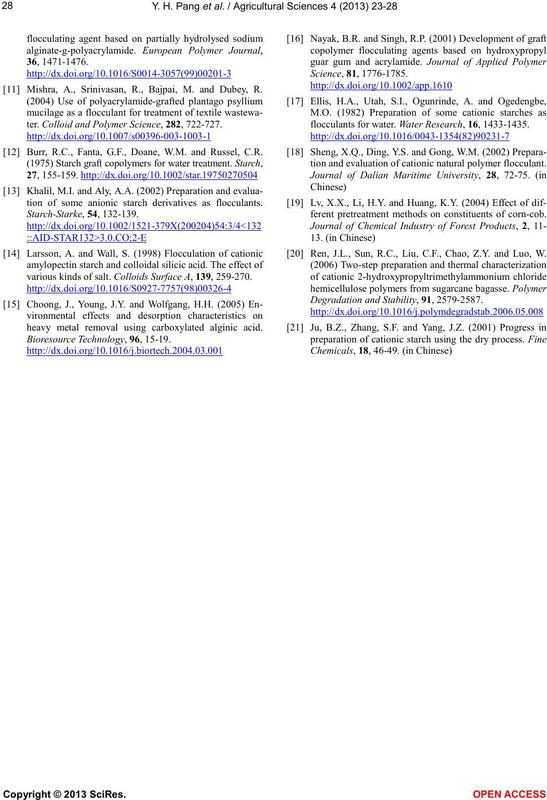 Progress in Polymer Science, 20, 987 -1041.
nal of Colloid and Interface Science, 273, 400-405.
and Environment Safety, 46, 29-33. Mishra, A., Srinivasan, R., Bajpai, M. and Dubey, R.
ter. 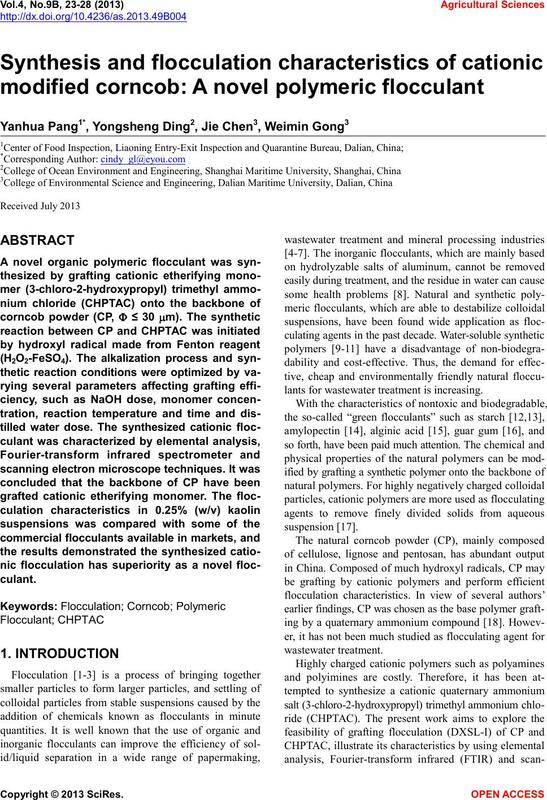 Colloid and Polymer Science, 282, 722-727. Burr, R.C., Fanta, G.F., Doane, W.M. and Russel, C.R. tion of some anionic starch derivatives as flocculants. various kinds of salt. Colloids Surface A, 139, 259-270.
heavy metal removal using carboxylated alginic acid. flocculants for water. 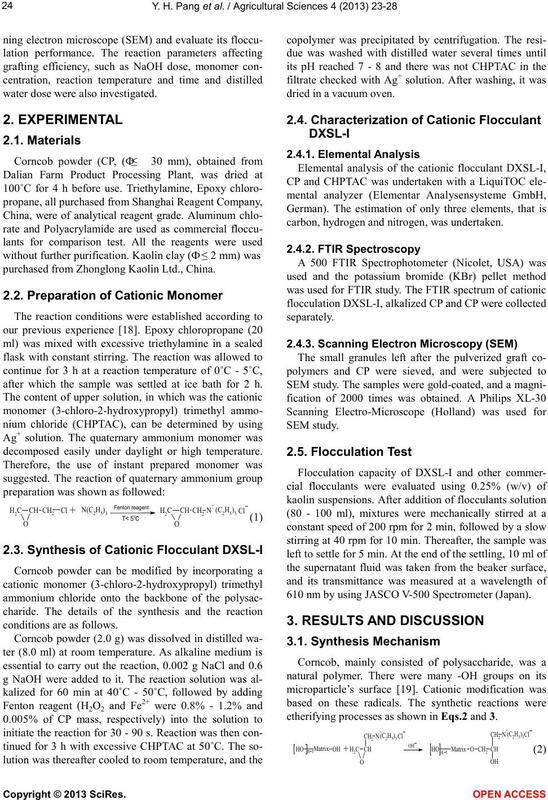 Water Research, 16, 1433-1435.
tion and evaluation of cationic natural polymer flocculant. ferent pretreatment methods on constituents of corn-cob. Ren, J.L., Sun, R.C., Liu, C.F., Chao, Z.Y. and Luo, W.
Degradation and Stability, 91, 2579-2587.